Infinite Wisdom (#3) is the horse that they all have to catch in this race, but he has some serious questions to answer as he moves up into stakes company. He’s never raced farther than 1 3/8 miles, and now must stretch out an additional two furlongs. It’s likely that he’ll be in a position to control the pace, but I wonder if he’s going to show up with as strong an effort as the one he put forth earlier in the meet. Brian Lynch’s horses have not been running well at this meet, and two of the fancied runners that he sent out last weekend – albeit on the dirt – were both eased. Perhaps that was just a fluke, but I still don’t totally trust this horse. I’m trying to beat him with MONTCLAIR (#4), who makes his first start off the claim for George Weaver. Weaver has not claimed many horses, but he has had success when he’s done so. Over the past five years, he is 4 for 16 (25 percent, $3.25 ROI) first off the claim. Montclair is also a marathon specialist, having been competitive in races up to two miles. He clearly should have won two back when he was stymied in traffic for the entire stretch drive. 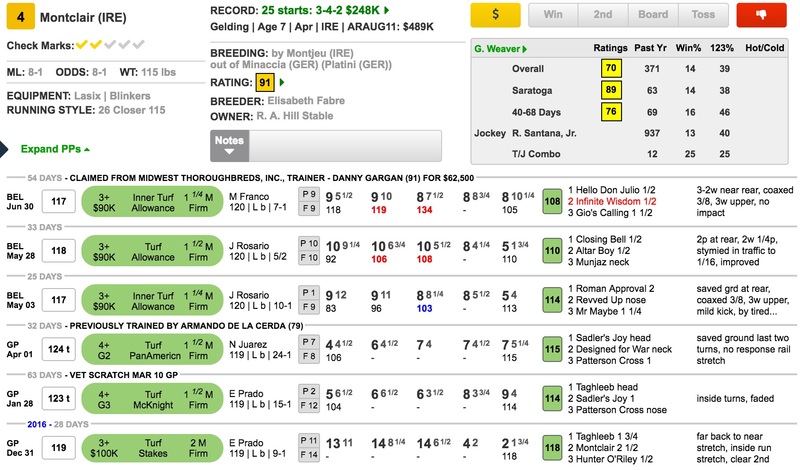 His last race was disappointing, but 10 furlongs is too short for him, and the fact that they’re running him right back in stakes company suggests that the connections are expecting a much-improved effort. The other runners that I want to use are Red Rifle (#7), who handles all surfaces and distances. He routinely runs well, but just rarely gets to the winner’s circle these days. I’ll use him underneath, and will also throw in Renown (#5), who ran well to win the Grade 3 Sycamore at Keeneland last fall. He’s good enough on his best day, and you get the sense that his connections must have been pointing for this race. I’ll dare bet “Montclair”but not leave”St Looie”out,vaya con Dios,amigos…. Good to see Stella back in the game…. 9th. Give Bush a push.. throw out last..
“Mr Cheerful” didn’t make me smile.